There are still some people who want the UVa basketball team to apologize for last season, and they're asking Kyle Guy for money. COLUMBIA, SC - The Cavaliers won&apos;t apologize for the way their season ended last year, but there are some people who still want them to. "Some people don&apos;t let it go on social media," says UVa junior guard Kyle Guy. "I get Venmos all the time saying I have to pay them five dollars because we lost. I don&apos;t pay them." 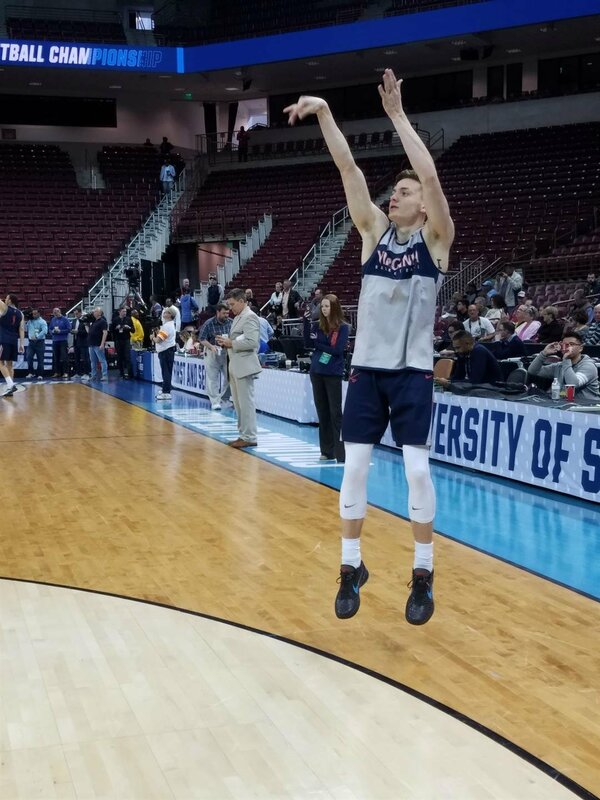 It didn&apos;t take long for Kyle Guy to pull up one of the recent requests for bracket reimbursement while back in the locker room. "I&apos;m not going to say his name, but somebody says, &apos;Requests two dollars for losing to UMBC,&apos;" says Guy. "That&apos;s probably the fifth one I&apos;ve gotten this week." This is a different UVa team from last season, for starters, they&apos;ll have forward De&apos;Andre Hunter back in the lineup. The sophomore who missed last year&apos;s tournament with a broken wrist. Tony Bennett says, "At 6-7, 6-8 with the long wingspan. Just his dimensions are good. Just a high-quality player, obviously." "It&apos;s going to be really exciting," says Hunter. "It&apos;s going to be my first time playing in this tournament, and I&apos;m just really excited. I&apos;ve been watching it on TV. Just being able to play I&apos;m really excited." Braxton Key has tournament experience, but it came while he was playing for Alabama. "It&apos;s going to be a great feeling," says Key. "It&apos;s funny I&apos;m back in SEC country, for sure. I have a little comfortability with these rims. We played here earlier this year, so that will help us for sure. We&apos;re all focused, we&apos;re all ready to go." UVa has the number-one scoring defense in the country, and they&apos;ll be looking to slow down a quick Bulldog offense. "They get up and down the court really fast," says Key. "They&apos;re a smaller team, they use that to their advantage. We have to control them a little bit with the things they like to do." "I know their tallest guy is 6-6, but I know they&apos;re fast and quick," says Kihei Clark. "We&apos;re going to have to pack it in and play good defense." Gardner-Webb senior guard David Efianayi says, "We just have to share the ball, move and cut. We can&apos;t really Iso the plays on offense. If we just share the ball, cut, move, and take great shots, we&apos;ll be fine." Gardner-Webb is making its first appearance in the NCAA Tournament in program history. Bulldogs senior forward DJ Laster says, "Everybody wants to win. Everybody wants to compete. Everybody loves the opportunity that we have in front of us right now, to play a Number-One seed. It feels good to be here, and be able to compete." "We&apos;re just going to continue doing what we&apos;ve been doing the whole year," says senior forward Jack Salt. "Focus on one game at a time, and hopefully that will get us to wherever we need to be." "We&apos;re in complete control of what happens right now," says Guy. "We&apos;re in control of our effort, how hard we play, how focused we are. If we take care of those things, everything else will take care of itself and we&apos;ll go to a place we haven&apos;t been before." Four teams from the Commonwealth play Friday in the NCAA basketball tournament.